i want a connection between Structure and Behavior like on the image. But it's not possible to creat a Block with "allocate". The Stereotype from the Block ina internal Block Diagramm can't be an activity Diagramm is this right? We are afraid that Astah SysML doesn't support allocate dependency at this moment. 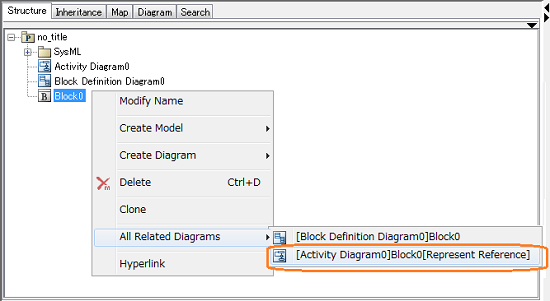 between Block and partition on Activity Diagram with the step below. You are able to find a related block or partition with the step as below. - Right-click on the partition and select "Show in Structure Tree"
- Right-click on the block and select "All related diagrams"